Banneaux is an unremarkable village on the edge of the Ardennes Mountains. In 1933 the Beco family were living there in a small house built by the father, Julien, an unemployed wire maker. There were seven children and the family was poor, living mainly on produce from their little vegetable garden. They were nominally Catholic and not conspicuously devout. Mariette was the oldest of the children, aged eleven. On the evening of January 15 she was looking after two of her brothers who were ill, and at the same time watching out for their father to return. She was nervous and did not like the long dark winter evenings. As she peered through the curtains she suddenly became aware of a bright light hovering in the middle distance. After a few minutes the light formed itself into a human figure—–“a beautiful lady,” as Mariette later reported. The woman was dressed in white and blue and was holding a rosary. Mariette looked again and then called to her mother, Louise, “A beautiful lady in our garden is smiling at me!” Her mother looked out but saw only a vague form. “Perhaps it’s the Virgin Mary!” she exclaimed, not unkindly. At school the next day Mariette told her story to her best friend, Josephine Leonard, who only laughed. This upset Mariette, so Josephine wondered whether there might be something in it after all. After school the two girls went to see the parish priest, Father Louis Jamin. A great change now came over Mariette, who had previously been rather unruly, much given to playing truant and neglecting her lessons. She began to prepare her schoolwork thoroughly, and each morning went early to church to pray. On January 18, at seven in the evening, Mariette went out into the garden. Her father followed her. The girl knelt down and began to pray her rosary. Her father watched in amazement as she raised her arms as if greeting someone. Again, as she later swore on oath, Mariette saw the figure she had first seen from the upstairs window: “She seemed to be standing on a platform of smoke.” Her father, who could see nothing, rode off on his bicycle and returned with his neighbor Michel Charleseche and Michel’s son, who was about the same age as Mariette. When the three returned, Mariette was walking out of the garden and into the road. “She is calling me,” she said. Mariette then returned home, went to bed and fell asleep. Father Jamin was sent for, and asked Julien Beco what the strange affair was all about. Julien, a lapsed Catholic, was in a highly emotional state and told the priest that he was certain his daughter had received visions of the Blessed Virgin. He made an appointment at the confessional for the following day and expressed his desire to return to the Church. 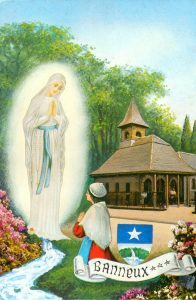 The Lady replied, “I am the Virgin of the Poor.” Again she led Mariette to the icy spring and told her that in the future it would relieve the sick of all nations. The following day the Virgin appeared again and said that she desired a little chapel to be built in her honor at Banneux. When the vision had departed, Mariette fainted. The Virgin did not return for several weeks, and Mariette was teased and taunted for her credulity. The story of the apparitions at Beauraing is related below. Some people in Banneux suggested that Mariette had invented her account of her visions after hearing of those events, which took place only about fifty miles/80 km away. But the people of Banneux themselves built the chapel to the Virgin, and it was dedicated on the Feast of the Assumption in 1933. Even before the shrine was completed, pilgrims to Banneux made claims of supernatural cures. For instance, a Spaniard named Benito Pelegri Garcia had a very badly injured right. arm. His wife heard the stories about Banneux and insisted that they walk there from Barcelona. Benito thrust his arm into the spring and felt it to be boiling hot. He exclaimed, “I have come all the way from Spain. If you are indeed the Virgin of the Poor, then prove it to me!” He withdrew the drain-tube from his arm and the wound healed immediately in front of many witnesses. Bishop Kerkhof wrote an account of Banneux in which he noted twenty miraculous cures occurring between 1933 and 1938. During the Second World War, Cardinal Van Roey issued an encyclical in which he declared that the events surrounding the apparitions were worthy of serious study. On August 22, 1949, the Bishop of Liege affirmed in a pastoral letter that the eight appearances made by Our Lady to Mariette were to be believed. Banneux is now one of the most visited shrines of Our Lady in northern Europe. The little chapel requested by her has been replicated more than a hundred times throughout the world, and though a pilgrim church was subsequently built, the original chapel remains. The modern shrine is vast and imposing but never cold or impersonal. Two stone circles indicate the places where Mariette stopped and knelt before Our Lady. The connection between Lourdes and Banneux was established in 1958, when a piece of the rock from Massabielle was mounted into the spring. In St. Joseph’s Chapel behind the Beco house is a statue of St. Joseph with the Christ Child. The square where the pilgrims gather, the Esplanade, whose main altar was consecrated in 1959, has the form of an aqueduct, symbolizing water as a source of life. It is also called the Altar of the Magnificat. On the left of the Esplanade is the Chapel of the Message. In one corner is a carved candlestick, symbol of the light of peace which comes to pilgrims through Mary’s intercession. There is a majestic statue of Our Lord, and on its pedestal the Beatitudes are carved in Latin. The sheer number of visitors made it necessary to build the Pilgrim’s Church, completed in 1985 shortly before the visit of Pope John Paul II. Set into the wall by the entrance is a stone from St. Peter’s in Rome. Other centers for prayer and worship are the Chapel of the Sick and St. Michael’s Chapel, where the Blessed Sacrament is in exposition every day. But the piece de resistance and spiritual center of the shrine remains the Chapel of the Apparitions, marking the spot where Our Lady appeared eight times. A picture by Leon Jamin shows the Virgin’s illuminated figure as seen by Mariette and in the middle of the chapel a white marble plaque recalls the place where she first saw Our Lady. Here a text declares: “She wanted to open her Motherly Heart.” The Blessed Sacrament is always reserved in the Tabernacle. The opening day for pilgrimages is May 1. The Assumption, August 15, is the occasion for an international pilgrimage. There has been a recitation of the Rosary every evening since 1933 without fail. Deign to listen to the prayers that thou hast asked be addressed to thee; have pity on all our spiritual and temporal miseries. Restore to sinners the treasure of Faith, and give to the poor their daily bread. Deign to relieve suffering, to heal the sick and to pray for us, so that thus through thy intercession, the reign of Christ the King may extend over all nations. R. Amen.